The concept of "school spirit," or having pride in one's university, is common across American universities. It is especially evident in sporting contests, but also shows up in student events and activites. Being "True Blue" and having school spirit means we're proud of UB's past, present and future. 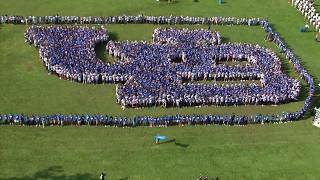 Each fall as part of Opening Weekend and new student orientation, incoming UB students assemble on the North Campus lawn to create an interlocking UB logo, showing their True Blue spirit. The campus community comes together every fall to celebrate the pageantry of Homecoming, the annual tradition of welcoming alumni, family and friends to campus. Homecoming features four days of fun-filled, family-friendly activities, including a festival and bonfire. 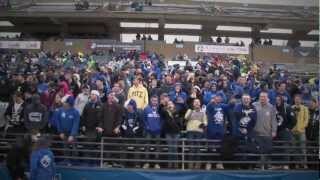 Among the many highlights is the annual Homecoming football game at a packed UB Stadium, where more than 25,000 people cheer the Bulls on to victory. Victor E. Bull is the mascot for UB Bulls athletics. 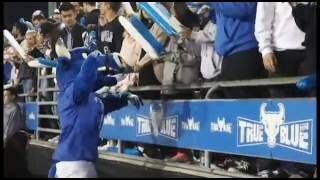 You’ll see him at football and basketball games — among other sporting events like swimming, wrestling and volleyball — encouraging fans to cheer UB student-athletes on to victory. What’s in a graduation year? Another element of school spirit is the pride students take in being members of a particular graduating class. For example, students who graduate in 2020 are members of the Class of 2020. Students often identify with their class year because many of their classmates are similar in age, enrolled in similar courses and will graduate together.